Six people were arrested after a brawl that left two police officers injured outside a nightclub in Manchester, New Hampshire. 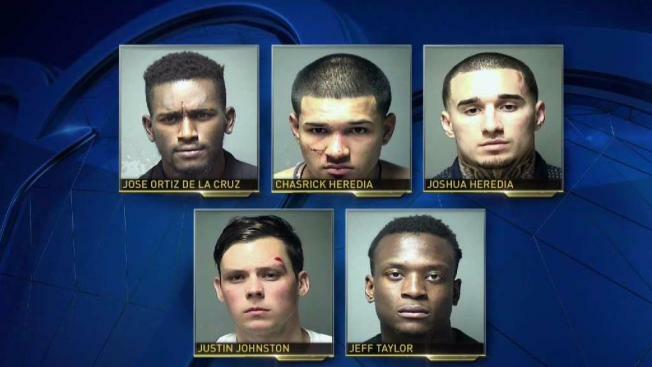 Six New Hampshire men are facing multiple charges in connection with a brawl outside a Manchester club early Friday morning. Multiple officers responded to Glow Bar on Hanover Street at about 1 a.m. after multiple neighbors complained of noise, police said. When officers arrived, police said a group of men were outside yelling at the club's bouncers. According to police, things quickly turned violent when two officers were seriously assaulted by two of the men. Several officers began removing the six men after the bouncer asked them to leave the bar for the evening. Two brothers, later identified as Joshua Heredia, 25, and Chasrick Heredia, 24, both of Manchester, appeared agitated and refused to leave the premise outside of the bar, police said. Another man, identified by police as Jeff Taylor, 24, of Manchester, began yelling at the officers while Chasrick Heredia while another man, identified by police as Jose Ortiz De La Cruz, 25, of Londonderry, began pushing one another and arguing about whether or not they should leave. The group of men moved into the middle of Hanover Street, allegedly yelling and pushing one another. The officers tried unsuccessfully to get them to leave. The men allegedly refused, so Officer Michael Roscoe Jr. attempted to place Chasrick Heredia into custody while several of his friends started to pull him away from Officer Roscoe. Officer Nathan Harrington stepped in to assist Officer Roscoe, transitioning Chasrick Heredia to the ground. Officer Canada Stewart was also helping with the arrest when Joshua Heredia began kicking and punching both Officer Roscoe and Officer Stewart. Officer Roscoe stood up and began defending himself against the attack. He approached Joshua Heredia while several men surrounded the officer and repeatedly attacked him. Officer Konrad Jaworoski grabbed Joshua Heredia and placed him into custody while the other men continued to throw punches at the two officers. Officer Roscoe sustained a concussion as a result of being kicked in the head by Joshua Heredia, police said. Officer Stewart was struck in the face by Ortiz De La Cruz and Justin Johnston, 22, of Manchester and sustained a concussion. Officer Harrington tackled the two men after they turned on him and allegedly began punching him. He was able to place Johnson into custody. Ortiz De La Cruz was also taken into custody. According to police, additional officers were needed to place a total of six individuals into custody to disburse the crowd. Chasrick Heredia was charged with second degree assault, riot and two counts resisting arrest/detention, while his brother Joshua Heredia was charged with second degree assault, riot, simple assault and hindering apprehension. Taylor was charged with riots. Ortiz De La Cruz was charged with riot, three counts simple assault and resisting arrest/detention, simple assault. Johnston was charged with riot, simple assault and resisting arrest/detention. All five men appeared in Hillsborough County Superior Court-North on May 11. Stephan Erich, 27, of Manchester, New Hampshire was charged with simple assault and riot. He was taken to Hillsborough County House of Corrections due to his uncooperative behavior, police said. It is unclear if any of the six men have an attorney.